The evil warlord, Kadar (Richard Lynch), attacks a caravan of performers in his quest to acquire a magic ruby held by Canary (Virginia Bryant). He catches Canary but not the ruby. He sends two young brothers from the caravan to the slave pits, with the promise that he will not kill them. Instead he plans on having them kill one another in gladiatorial combat. 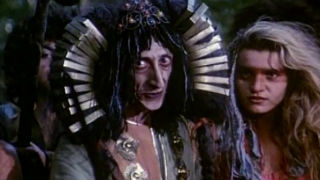 Years later, the brothers, Gore (David Paul) and Kutchek (Peter Paul) realize they have been nearly tricked and escape. Soon they are tasked with recovering the ruby from a fearsome dragon and rescuing Canary from Kadar’s harem. The core of the The Barbarians is very much a comedy. 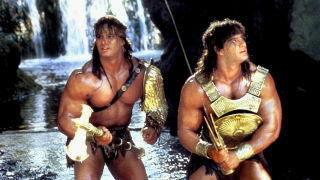 David and Peter Paul tromp through each typical fantasy film scene and destroy it with their straight forward lunk-headed approach. . For many action movies, the musclebound lead can become a liability, but The Barbarians turns the Paul brother’s limited range into an asset by integrating it into the comedy. The brothers appear to be enjoying every minute they are on screen and this translates well, creating a much more lighthearted film in the normally ponderous fantasy genre. The story itself is largely free of the casual cruelty that flavors a lot of barbarian movies, and instead chooses to focus on its numerous silly characters. Kutchek and Gore are the spectacle here, making the rest of the cast fade into the background. Except perhaps, Michael Berryman, who is going to stand out no matter what, and Richard Lynch who imbues Kadar with the sort of mustache twirling arch-evil that makes it a real pleasure to see him finally get his comeuppance. It’s not all silly dialogue, there plenty of battle scenes and David and Peter prove themselves decent action heroes. For the normally impoverished productions of mid-eighties fantasy, The Barbarians pulls off some well realized set-pieces, including an extended chase on horseback, a battle with a dragon, and a rousing final fight with Kadar. This isn’t a lavish production by any means, but director Deodato makes good use of crowded locations to give the world a sense of life. The Barbarian Brothers with real snap-on accessories. The Barbarians is mindless fun and the perfect counterpoint to duller entries in the genre, like Hawk the Slayer (1980). I can’t say it does anything particularly inventive or original, but it does take the typical tropes of fantasy and send them up just enough to be amusing without spilling over into parody. It’s a tricky balancing act and it’s not always successful, but it works most of the time. I’m not going to hold up The Barbarians as the pinnacle of low budget barbarian movies, but it’s easily the one that I have had the most fun watching. Shout Factory released a cleaned-up DVD version of this film, but do yourself a favor and experience as it was meant to be seen, as a nth generation VHS image playing late at night.